Last week I got to see my nephew off to his prom and it inspired me to look back a few years (several) to my own. Then I thought it would be fun to get other folks’ prom pictures. Let’s take a look. Here’s my senior prom picture. What do you think of the gold lame’ and red satin? I actually wore gold shoes. 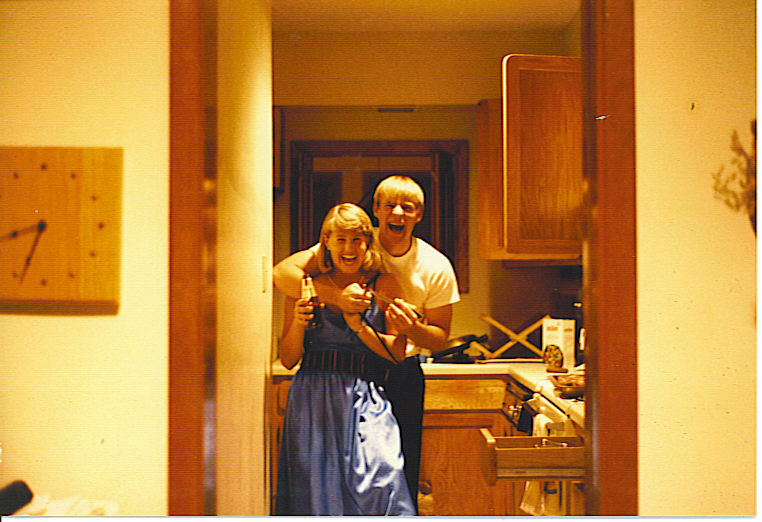 The year before, I went to my then-boyfriend’s senior prom. I don’t know what I was thinking to be honest. White velvet and blue satin with gloves? Really?! The saddest part, I designed both dresses (along with many others). My mother is a seamstress and for every dance I’d pick the material and tell her what I wanted. These, sadly, were what I came up with. As my friend Tim once told me, leave the designing to the professionals. These are hubby’s prom pictures. I actually contacted his old girlfriend from his Facebook page and asked for them. 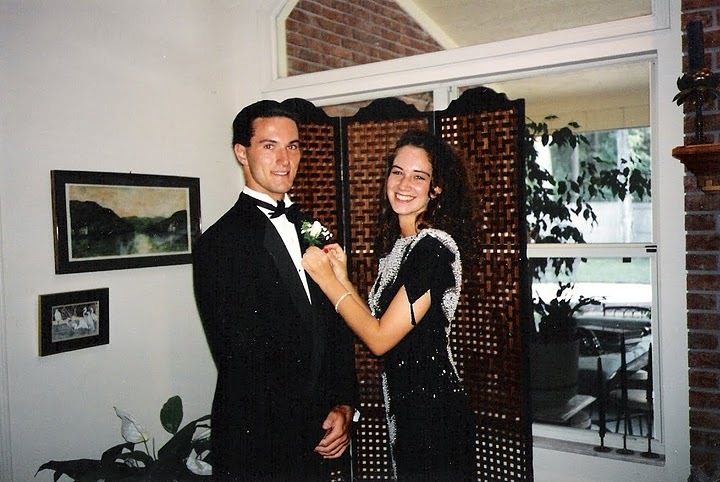 When friends saw the pictures, they thought he and his date looked like siblings with the feathered hair. Please also notice the gloves he’s wearing! Nice touch, right?! 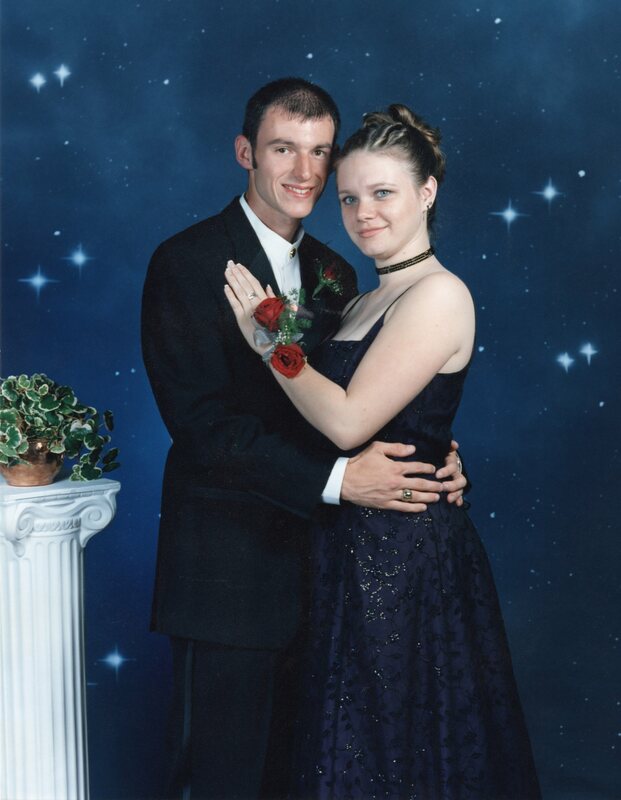 This is a picture of my friend Alicia with her date, Shawn, at the senior prom. Shawn remembers way more about that night than I do. He reminded me that, “We had pre-game at Alicia’s, post-game at the Anaheim Hyatt, and we played Pictionary with you and Josh.” I remember the Pictionary. I want to say Josh and I won, but I could be totally making that up! 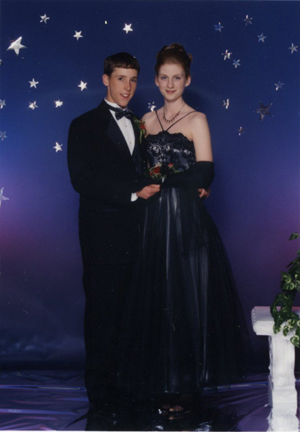 Katie went to her junior prom in 2001 and senior prom the following year. She then married her high school sweetheart! Here is an assortment of other prom pictures! Gotta love pubescent fashion! BTW… It’s not too late to send me your prom pictures. Click here!